Give your porch, patio, or deck a more upscale look and feel with the Falkner collection. The coffee table is part of a fully coordinating Falkner Aluminum ensemble that includes a deep seating collection and a dining collection. All of the easy-care pieces are designed for outdoor use in all weather, yet they are attractive and versatile enough to enhance indoor decor as well. Lightweight yet durable, the table is made from the highest grade of aluminum. It is sand casted, covered in a dark powder-coat finish, and designed to be rust-free. 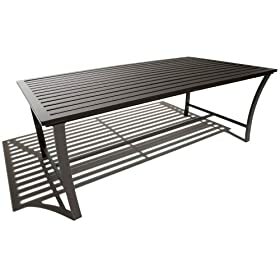 The ribbed design gives the table a smooth, even surface and allows for rain water to fall through and dry out. Ready to use immediately, there is no assembly required. The table measures 45 inches wide by 25 inches deep by 16-1/2 inches high and weighs 23.2 pounds. It has a weight capacity of 200 pounds.